This is a free guided imagery script of an imaginary walk in the woods that will renew your energy and vitality. It is published in Julie’s Yoga Meditations book and is on the CD included with the book. See below. Begin by treating yourself to an enjoyable and satisfying stretch. Go ahead, it’s time to loosen up and stretch so you can reclaim your energy. That’s right. Stretch all over. And now, please allow your entire body to settle and relax comfortably . . . if your legs or arms are crossed, please uncross them and settle yourself into whatever you are sitting or lying on. Take in a nice big breath …fill your lungs full…and breathe out to let go from deep inside… And now, simply follow your breath in…and out…allowing each breath to refresh you on many levels. With your eyes closed or barely open, begin to shift your attention away from the world around you to your inner world of sensations and into your imagination. It will do you good. Take a big breath in . . . And sigh it all the way out. 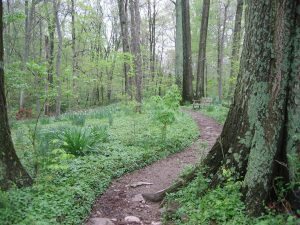 out into the woods for an adventure that will help you feel refreshed and so you can feel like yourself again…these woods are quite special and a place where you can escape and feel safe…it’s your own private hideaway. Pretend as if you’re there now. It’s the perfect kind of day to be outside…it’s gorgeous and the temperature feels great… Overhead, the sky is a brilliant color… the sunlight surrounds you with healing light and warms you, through and through … the clouds form into all sorts of shapes and drift on by, and as the clouds come and go, your worries evaporate … your mind clears, like the depth and expanse of the infinite sky…The trees are magnificent and the woods are brimming with life… it smells delightful. Imagine yourself walking along a path…take a little time to yourself and notice what it’s like…how wide is it…what is it made of…how does it feel to be walking on it. And with each step you take, notice how you feel more and more alive with a bounce in your step…and it’s hard not to grin. Walking feels effortless and invigorating …like you’re gliding upon a magic carpet. Walking along, your tiredness melts away, and more and more you notice feeling renewed and revived with boundless energy. There’s a spring in your step and it feels great to be here. Looking around, notice your surroundings…there are many types of trees…all different shapes and sizes, each one is inspiring in its own special way…and perhaps there’s a rainbow of smiling wildflowers dancing in the light …and the smell of the woods comes alive. Notice the sounds that come and go…perhaps you hear the sound of a gentle breeze rustling through the leaves…the songs of the birds…or an occasional bark of a dog, off in the distance…what other sounds can you notice? The sunlight streams through beaming a golden light that dapples through the branches above… casting shadows here and there … and the air tingles and the woods sparkle with life…it feels radiant and the fresh air renews your energy with each and every breath you take. Take a few moments to continue down your path, walking along at a comfortable pace, following your curiosity and losing yourself in the sounds, the smells, and the colors all around. Off in the distance, you start to pick up on the sound of tumbling water and it sparks your curiosity as to where it’s coming from, it might even be a waterfall … so you take off in a new direction, not sure what you’ll find … and lo and behold, you discover a beautiful creek that is gurgling and chuckling by…the water cascades constantly over the rocks like a dance…and the water’s surface glimmers and glows…being aware of the water as it streams on by… If you wish, you dip into the refreshing stream of water and it feels exhilarating …and you feel invigorated with energy…Relishing each and every moment…and you are reminded that this very creek gradually flows into the river that eventually joins the oceans of the earth. Back on your path again, notice how the canopy of trees is protective and comforting and how the leaves whisper in the soft breeze…. And the sunlight sparkles through, bringing its warmth and wonder to everything it shines upon, and you drink in its beauty…soaking it’s magic into your heart of hearts. And now you become aware that there’s a clearing up ahead and as you enter there is a hushed silence that is felt…the clearing is carpeted in softness…and it feels magical, and enchanted. Take some time to explore this special place…how large is it…what do you notice in the horizon…what is the air like…what sort of plant and animal life are present? And now your attention is captured with watching the squirrels and rabbits darting about … noticing the birds flying and hopping from place to place, singing their songs … and noticing all the other wildlife at work and at play. Notice how boundless energy begins surging through you so you feel like joining in all the activity … feeling the urge to enjoy yourself and play, just like the animals. So, imagine enjoying yourself and having fun, exploring and discovering and playing… perhaps you’d like to fly like a bird or climb a tree like a raccoon, and be carefree. And off in the distance, you notice a special place that has a hammock…and a park bench…and a swing and you seem to glide on over and settle into one or the other for a while…enjoying yourself completely and allowing yourself to daydream. And now, you notice that an animal is trying to get your attention …what is it… what’s the animal like…and now it’s coming closer … and you’re getting excited… and sure enough, you can tell that it has a gift or perhaps a message just for you … and that’s what happens, you are given a personal gift or a message from this special animal. And now, you’d like to give something back in return. And from this extraordinary space, you begin feeling lighter and more free and easy, feeling the surge of life pulsing through you … replenishing your energy … and each time you breathe, you can tell you are being completely restored from deep inside, from an unending and powerful source of energy and vitality …and you feel your energy and enthusiasm pouring back to you, to continue on with courage, and a willingness to trust, knowing you can more than handle what’s up ahead with a knowing confidence. Whenever you’re ready, you can begin to stretch and move… feeling full of life, alert and ready for whatever comes next. 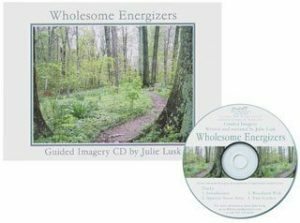 Get Woodland Walk (and 2 more guided imagery scripts) on the Wholesome Energizers CD now!